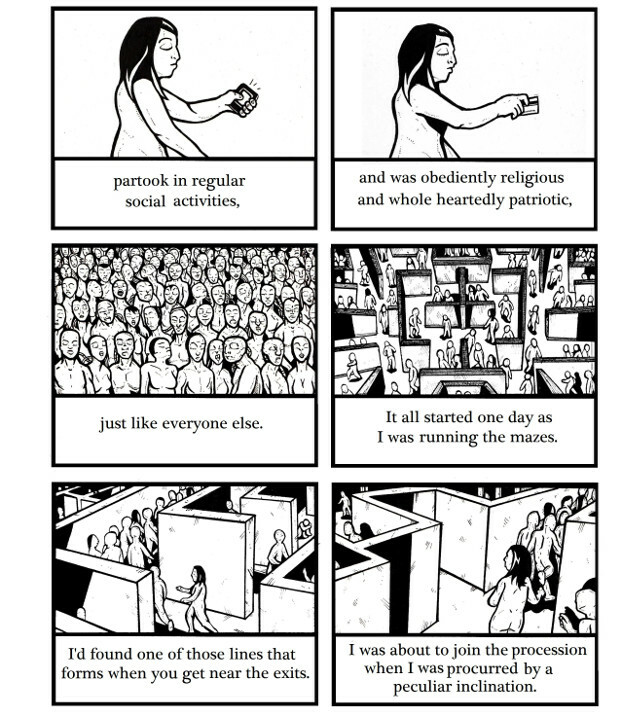 Science Fiction Comics “The Prophet” tells the tale of a strange world were everyone exists in synchronicity following a single lifestyle, a single diet, single brand, a single ideology. As a result the citizens are almost void of any individual characteristics, no fashion, little features and most peculiar of all they have no eyes. Somehow despite the strict routines and regulations one young girl is destined to become an anomaly... after all what would happen in a world of the blind when one person opened their eyes and could finally see? As far as dystopian fantasies are concerned I don't think I did anything particularly ground breaking with this story however I do feel like it was a successful remix of a various ideas that have inspired me throughout my life. It was rather cathartic for me to pull out a whole bunch of references including H.G.Wells, George Orwell, Giger and a dash of “The Holy Mountain” and put them into my own mythology. Despite the various roots for the work and the entirely fictionalized events, the story remains extremely personal to me as it not only reflects my literary mentors but is clearly a depiction of the world as it is right now (whenever you read this). 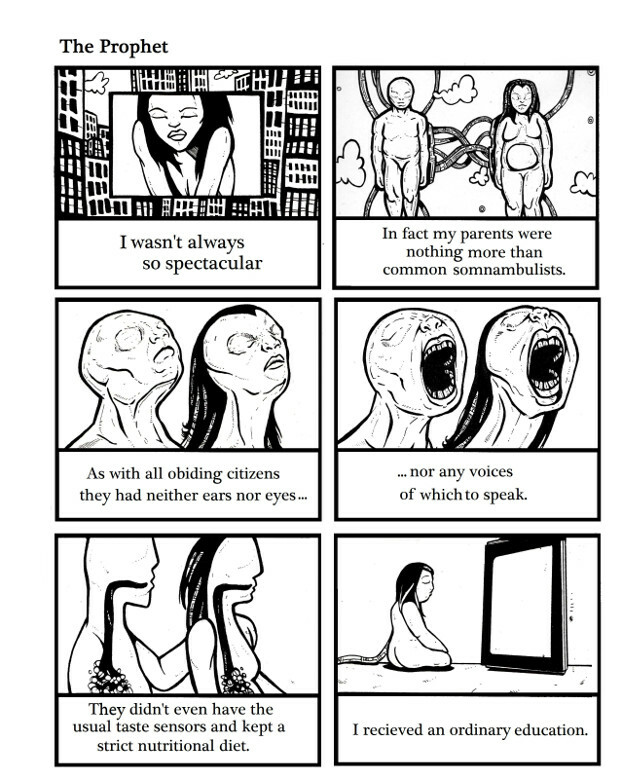 This short scary story was drawn in the late summer of 2012 as a part of my exhibition entitled “None of These Things”. The series examined notions of progress and humanity through a series of surreal portraiture. The images depict various human faces intermingled with symbolic architecture, primarily bricks and crowd scenes taking on cerebral shapes. The idea was to remind us of our tribal roots and the collective unconscious as juxtaposed with our modern metropolis. There were approximately 20 solitary portraits done using these metaphors. The comic strip “The Prophet” was presented as a 30 inch by 40 inch framed ink drawing complimenting the surreal contemplative portraits by narrating a possible future for the characters and our selves. 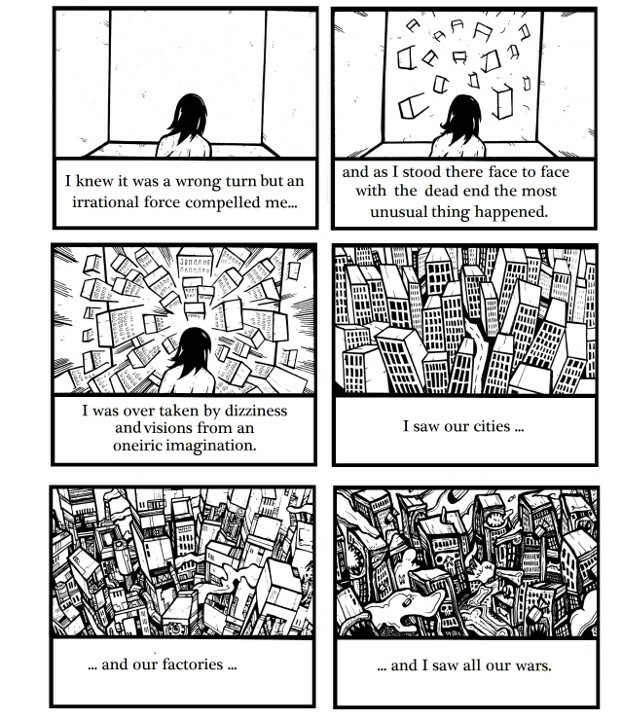 It was an interesting idea and I plan to create more comic strips as wall art for upcoming exhibitions.